The attach-extend shape (Japanese tsukenobi) is this way of playing, in which Black builds up his shape and leaves White with a cutting point. 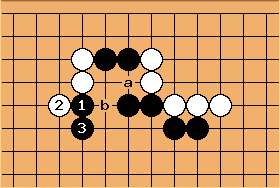 This operation occurs in a well-known joseki for the 4-4 point (attach-extend joseki), but is of much more general application. It leads naturally to positions in which both sides become stronger; and therefore it is from a fundamental point of view a defensive rather than an aggressive way to play. It might be suitable in positions where Black could make good use of strength. 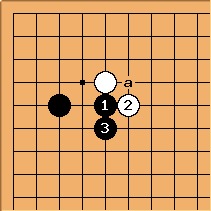 It is seen in many variations of double kakari joseki. 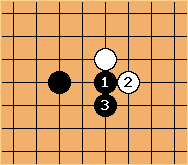 With the high approach to the 3-5 point, the attach-extend pattern is joseki (played recently by Yamashita Keigo), as is the difficult line with the cut at a. In such positions, it is common to see the attach-extend of and being played to prevent White from cutting at a. 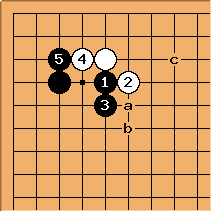 Although can also protect the cut by playing the bamboo joint at b, such a move is slack and allows White to block at . However, Black has to take into consideration of starting a fight by wedging at b. In this case, it would most likely be an overplay.